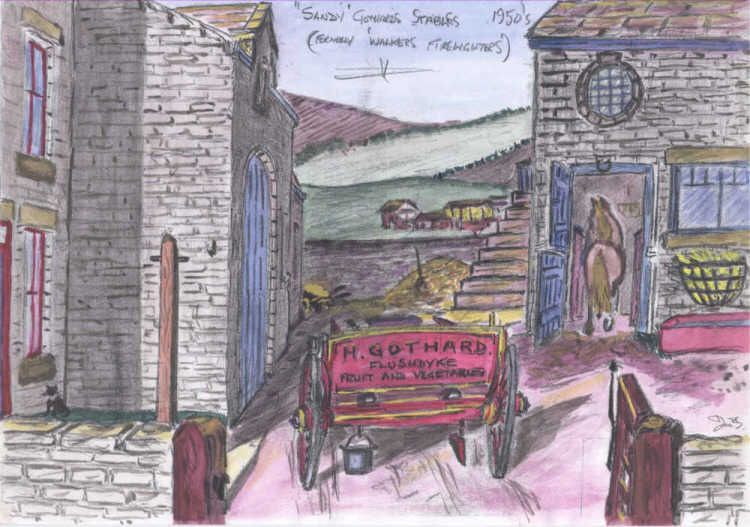 "Sandy", Harold Gothard, ran his fruit and vegetable business from here in the 1940s and 1950s. He delivered his produce all around north and west Ossett (and beyond) in his horse-drawn cart, depicted above. The horses being housed in the stables. The same buildings had previously housed a manufacturing business making Walker's "Blaze-Away" firelighters, which paradoxically all came to a sudden end after a fire in the 1930s. Behind the stable block is Owlers Farm, which is still in existence and has been owned by Mr. Norman Stead since the 1950s. This area is now used by Bridge Garage and the stable premises, although still recognisable, have been reduced to a single storey building.